This smoothie contains two of my favorite thickeners, banana and avocado, making for one creamy smoothie. Add in a few berries and spices for a tasty treat you may need to spoon out of your blender it’s so thick and creamy. Here are the many health benefits this healthy smoothie imparts. Antioxidants: the berries and banana offer plenty of free radical scavenging antioxidants. Anti-Inflammatory: the avocado and the spices help reduce inflammation throughout the body. Weight Loss: stay satiated for hours with this filling smoothie. Good Eye: avocado, banana, and berries support the health of your eyes. 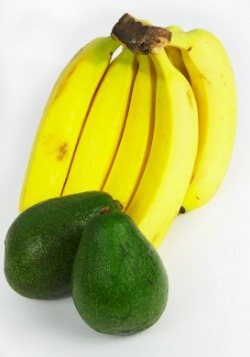 Good Heart: both avocado and banana provide cardiovascular protection. Good Digestion: eliminate and assimilate (key nutrients) with ease. Healthy Fat: the avocado provides all important healthy fat for your brain, skin, hair, nails and to stabilize blood sugar levels. Healthy Bones: the nutrients in this smoothie combine to help build strong bones. Anti-Cancer: the avocado, berries, and spices help prevent cancer. There you have it, the epitome of a healthy smoothie. By incorporating one or more of the add-ons you can take the nutrition of this smoothie up another level or two. I find the spices really add a nice flavor, and I used frozen blueberries if you’re wondering. You may need to add a little more liquid if your blender isn’t powerful enough to blend through this thick concoction. Enjoy! Please leave a comment below if you try this tasty avocado banana berry smoothie. Happy Blending! I am drinking this one right now and its very yummy ! I added Chia seed and ground flax seed. Delicious and nutritious ! Just made this! So delicious!! I sprinkled the smoothie with 4 pieces of dark chocolate chips. Dark chocolate chips – brilliant, Leona!